As the sun sets behind this metropolitan city, this time capsule of the nineteenth century is aglow with multicolor light, coloring the past in a modern shade. Lodz, Poland, whose name translates to "boat," is the third largest city in the nation and is the capital of Lodz Voivodeship. Once a small town in 1332, Lodz grew to become a powerful city with the help of industrialization. With its influx of immigrants, Lodz became a multicultural, industrial hub renowned throughout Poland. Lodz is famous for its contributions in the arts, holding one of the best museums of modern art, Muzeum Sztuki. 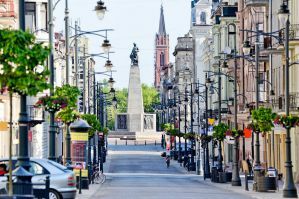 One of the main tourist attractions of Lodz, however, is the Piotrkowska Street, a high street that runs for around 3.1 miles. On this street, an endless promenade of restaurants, bars, and boutiques can be found, making Piotrkowska one of the longest commercial streets in the world. Other tourist attractions include Izrael Poznanski Palace, Palm House, Canal Museum, Museum of Cinematography, and Planetarium EC1. 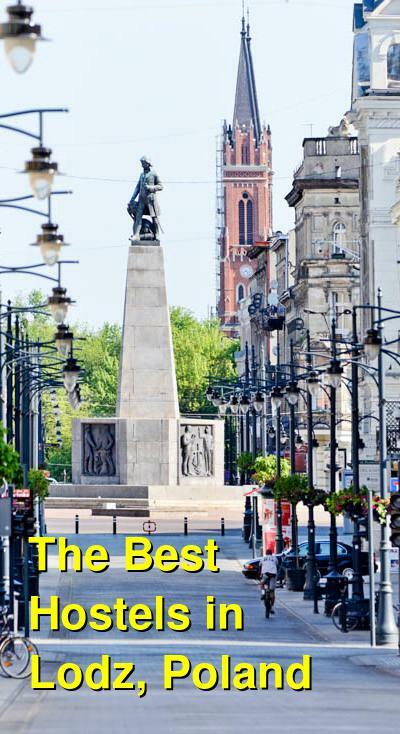 With all that there is to do in Lodz, you are going to need a place to stay. Many of the hostels available in Lodz provide comfortable lodgings for a price much more affordable than the hotels and motels available. How much do hostels in Lodz cost? Located on the famous Piotrkowska Street, the Music Hostel adds a melodic flair to your stay. Offering over 30 beds for its guests, all bedrooms are shared in increments of two through six. Rooms are clean, comfortable, and provide guests stressed out with the wear and tear of travel with a calming setting to decompress and unwind. The Music Hostel has a common room that holds comfy sofas, a TV and DVD player, a small collection of books and newspapers, and a fully equipped kitchenette that provides free tea and coffee during all hours of the day and night. Meals are served in the cafe but are not included in the original price. There are also vending machines scattered throughout the Music Hostel. Other amenities include lockers, meeting rooms, washing machines, parking, cable TV, free Wifi, and more. Named in 2008 as one of the best hostels in the world, the Flamingo Lodz Hostel is located near the train station and shopping mall but is relatively far from many of the main tourist attractions. The Flamingo provides clean bathrooms and bedrooms as well as a friendly staff. For introverts looking for a quiet place to stay, the Flamingo has lodgings that are relatively peaceful and serene. Rooms are small but cozy and can be offered in varying types. There is a common room where you can watch TV as well as socialize with some of your fellow travelers. There is also a kitchenette that you can use during all hours of the day as well as free tea, coffee, and cookies. There is a restaurant in the Flamingo, but meals are not included in the original price. Other amenities include lockers, steam rooms, card phones, and hair dryers. A relatively new hostel nestled in the center of Lodz, GoHostel is located near many tourist destinations as well as the Lodz Fabryczna, the largest train station in the nation. With a total of six guestrooms, all rooms are shared in the form of bunkbeds. There is also a common room that includes a TV, kitchenette, and complimentary tea, coffee, and cookies. Providing a homelike atmosphere for travelers, GoHostel also provides its travel-weary patrons with breakfast. Other amenities include security lockers, cookers, fridge and freezer, steam rooms, meeting rooms, microwave, reading lights, air conditioning, and more. If you are on a tight budget, Hostel Lawenda is a perfect place to stay as they offer the cheapest accommodation possible in Lodz. Located in the post-industrial area of the Chojny district, Lawenda is within the vicinity of Piotrkowska Street and various train stations. It should also be noted that it is only a fifteen-minute car ride from Atlas Arena. Room types come in single and double beds as well as shared rooms for eight people. All bathrooms are shared and can be found on each floor. The hostel also acquires a garden as well as pond that allows you to get a taste of rural life within the city. Breakfast is included within the price as well as complimentary coffee and tea. Other amenities include a common room, steam room, reading light, cable TV, and safety deposit box. Enjoy your time in Lodz, Poland!